I didn’t cook the first Thanksgiving meal I hosted. My roommate and I had my mom’s old dining table, and my grandmother’s old dishes, which meant that if enough people brought their own chairs, we were equipped to host twelve people for Thanksgiving. I handled the table setting, my roommate the cooking. He knew all about what to do, he said, speaking with such conviction about the virtues of giblet gravy, that I simply readied myself for a showstopping turkey feast. There would be giblet gravy, and sage stuffing, and not one but two turkeys – an absolute necessity if we were to have a place to stuff all the stuffing that would be needed for our twelve guests. My mother heard about the two turkey plan and pronounced it asinine, but I saw no cause for alarm – it was her usual reaction to nearly everything she hadn’t thought of herself. I remember we had a merry meal, though as to the meal itself, I don’t remember much. There were pumpkin pies in supermarket boxes, and probably some mashed potatoes, and there were indeed two turkeys, and they were mostly cooked through. What really sticks with me, though, was the stuffing. My roommate made stuffing from a recipe he made up on the spot, tossing in his best guess as to ingredients, and then filling both birds. He used white bread from the local supermarket, of the sort that instantly liquefies upon coming into contact with any sort of moisture. I believe he may have tried to dry it out beforehand, but maybe not, and it wouldn’t have mattered either way: this bread was chemically engineered not to dry out. So, my grandmother’s antique serving dishes were filled with balls of sage-scented slime. Each guest gamely took a small helping and graciously pronounced it delicious. The next time I hosted Thanksgiving, I had long since moved into my own apartment, which came with a battered chrome table, at which I hosted my mother, my boyfriend, a coworker who would have liked to be my boyfriend, and another coworker who was temporarily without any boyfriend. I didn’t have much to guide me, except the knowledge that I probably didn’t need to make two turkeys, and that some guidelines should probably be employed when making stuffing. I bought a copy of Food and Wine magazine and followed their Thanksgiving recipes to the letter: there was turkey basted in butter, and a stuffing of prosciutto and escarole and some country bread that had been air-dried ahead of time and held up quite nicely, thank you very much. I steamed Brussels sprouts and tossed them with red grapes, a colorful dish that my boyfriend objected to, on the grounds that the grapes would compromise the integrity of the Brussels sprouts. They didn’t, of course, and in fact were quite tasty, but the real hit of the evening was the cranberry sauce, which was spiked with Wild Turkey. The following year, I bought a copy of Gourmet, and carefully followed the Thanksgiving recipes in that issue, and decided that was going to be my menu, so each succeeding year, until last year, my spattered magazine made its annual appearance. I’ve fine-tuned and simplified the stuffing recipe, my favorite part of the menu, and vary only the cranberry sauce – although I’ve found several recipes I like, I’ve not found one that improved upon my Wild Turkey spiked cranberrypalooza, which, due to the presence of children, has not been served since. This was the menu I served in my next apartment, to whatever friends happened to be around, and to The Foreigner the one year I hosted Thanksgiving during our marriage. This was the meal I served to the friend who flew in to keep me company when I found myself a single parent of a small toddler, alone in a new city. I served this meal to The Departed each Thanksgiving, and to his children on alternating Thanksgivings. After he left, I hosted one final Thanksgiving, and then I was done. I had eaten the same meal off and on for over fifteen years, and I didn’t really care if I ate it again. The Dog was nearing the end, and having guests would be trying for him, and The Child was less interested in hosting children she only saw once a year than she was in finding out what Black Friday was all about. So I made reservations, and we had fish for dinner, followed by a trip to the mall and an electronics store; we looked at the stuff, and mostly the crowds, and didn’t buy a thing. This year, we had steak, and a somewhat more productive evening of shopping in a department store downtown. I expect that at some point, we’ll feel nostalgic for Thanksgiving and return to it. At the moment, though, we don’t really miss it, with one lone exception. I miss Pie Friday. You know what I mean. The day after Thanksgiving. The one day of every year that it’s socially acceptable to eat pie for breakfast. I don’t care much about pumpkin pie – though most pumpkin pie is simply mediocre, the fact is, when it’s good, it’s quite delicious. The truth of the matter, though, is that I simply enjoy having a lazy day that begins with a slice of slightly soggy-crusted pie from the fridge. So, this year, on the night when I’d normally be drying out cubes of cornbread in the oven, I made ricotta cheese. If you’ve never done this, I highly recommend it – it sounds very difficult but in fact is comically easy, so for very little effort you get some very nice ricotta with an ego boost on the side. I used the recipe from Epicurious.com, and produced about 16 ounces of very creamy, mild ricotta. I let it drain longer than called for in the recipe, so the end result was a somewhat dry ricotta, which was what I wanted so as not to end up with too much moisture in the final pie. I found this recipe on the Anson Mills website, and no, I don’t know how or why I found myself on the site. The company, if you’re not familiar with them, specializes in heirloom grains, and offers overly complicated and somewhat pretentious recipes to go with them. I attempted to print out this recipe, which would have resulted in 11 pages to navigate, so I cut-and-pasted only the pertinent parts of the recipe into a Word document, which I managed to trim down to three pages of exceedingly dense text. I’ve trimmed the recipe down further for you, dear reader: Don’t be deterred. I didn’t create a lattice pie crust that I baked separately, then laid into place on top of the pie, and neither should you. I also didn’t use their special heirloom grains, which seems like the wrong place to skimp given the people selling the grains created the recipe for the purpose of telling you how to use them, but then again, the instructions for the recipe say you should overcook the rice, so it struck me that any decent-quality rice would work fine. I used arborio. I think it came from Costco, but I could be mistaken; certainly, it’s been in my pantry for a while, and thus might possibly qualify as an heirloom. Regardless, it was quite tasty. The place you shouldn’t skimp is the ricotta – it’s the absolute centerpiece of this pie. Get yourself some good quality fresh ricotta, or make your own, but please avoid the supermarket stuff if you possibly can. The pie, though? It is lovely. It’s sort of a cross between a cheesecake (without the tang) and a rice pudding – a little custardy, a bit of bite from the rice, with a lovely milky ricotta sweetness reminiscent of the finest cannoli Little Italy has to offer, but better. It is very filling, so you won’t need much to feel sated and spoiled. 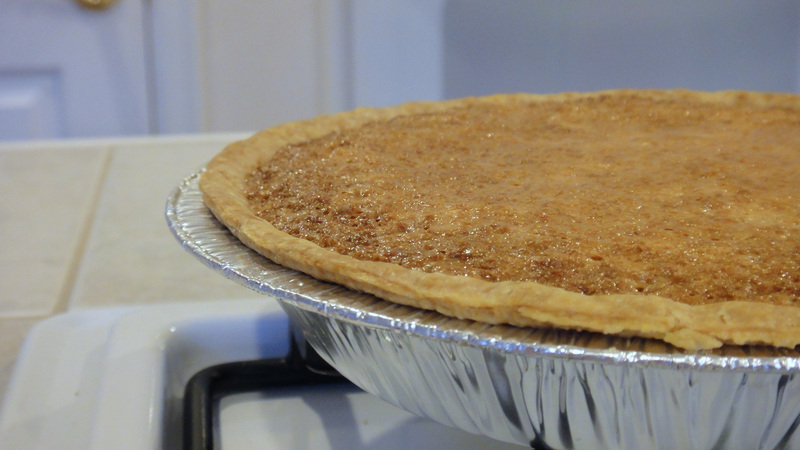 Some tips on baking: The Anson Mills recipe says you can take the pie out of the oven after 45-50 minutes, and the center will still be a bit jiggly. The center was a lot jiggly at that point in my oven, which always requires extra baking time. I needed to add an extra twenty minutes to the baking time; your mileage may vary, too. The real tip-off is the degree of jiggliness of the center – if it’s a lot jiggly, it’s not done yet. You are looking for just a little jiggle. If we use a Charlie’s Angels jiggle scale, you’re looking for Kate Jackson, not Farrah. I know Thanksgiving is over, but since this is technically an Easter pie recipe, you can get in plenty of practice before you serve it to guests on the correct holiday. Or not. It’s great for breakfast, too. 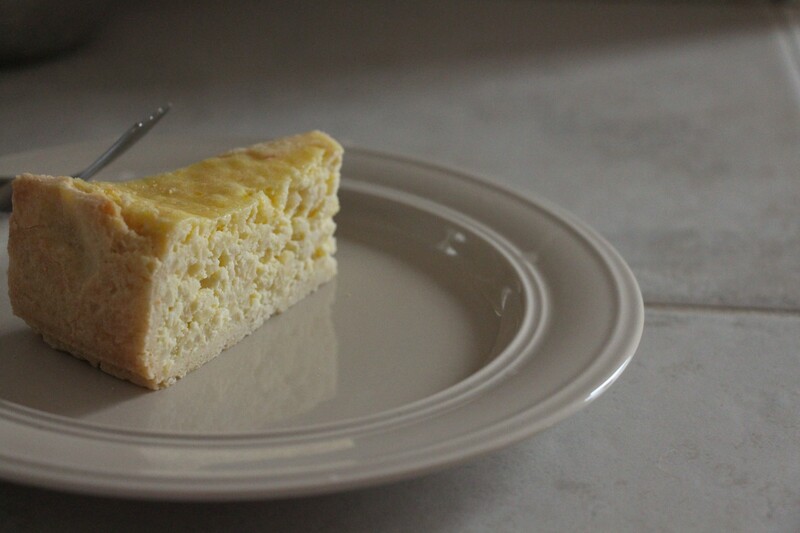 I originally found this recipe on a blog called Spellbound Cafe. I have no idea what I was looking for at the time, but this recipe promised me that I would taste the pie and be amazed, so I printed it out. I’m glad I did, because the Spellbound Cafe blog, sadly, no longer seems to be there. And I’ve made this pie several times since I found it, always to rave reviews. Part of the reason I make this pie so often: I always have the ingredients I need for it on hand in my pantry. I guess not everyone keeps Karo syrup and coconut around, but if you do, then you are always ready to show up with a fresh-made pie that will knock people’s socks off. And you can just shrug and say, Oh, you know, it’s just a little something I whipped up at the last minute. You won’t be lying. People have to decide whether to love you or hate you at that moment. If they want the recipe, though, and you agree to share it*, they’ll opt for love. I don’t even bother to make my own pie crust. Nobody cares about the crust on this pie. The filling is just that good: Sweet and silky-smooth contrasting with the slightly crunchy/slightly chewy oatmeal and coconut. Think pecan pie, but better. No, it doesn’t look like much. The Wow just kind of sneaks up on you. That’s how love works, sometimes. Mix it all up in order. Pour into pie shell. Bake at 350 degrees for 40 minutes. Center should spring back when touched lightly. If it's wibbly-wobbly, it's not done, and needs more time in the oven. *You don’t have to. I won’t tell.